In digging for news on the nor’easter that whacked New England (and my house in southeastern Massachusetts), I happened upon several compelling images. It seems that the monumental snowfall highlighted some land features of New England, including its longest river, one of the largest manmade reservoirs in the United States (Quabbin), and the scar of a vicious tornado. 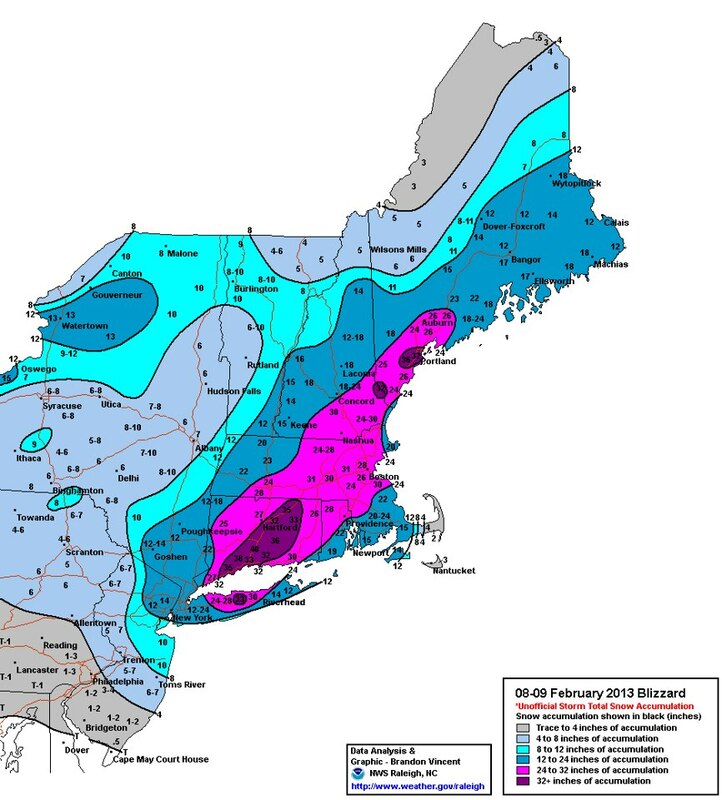 EarthSky published a map of snowfall totals compiled by the National Weather Service Hydrometeorological Prediction Center. About 35 to 40 million Americans live within that snowy bullseye. Finally, our colleague Jeff Schmaltz on the LANCE/MODIS Rapid Response team noticed that while the skies cleared over New England and the Canadian Maritimes on February 10, cloud streets lined up offshore. Cloud streets form when cold air moves over warmer waters, while a warmer air layer (or temperature inversion) rests over the top of both. Read more here from my fellow Earth Observatory writer Adam Voiland. By the way, I am not buying into this idea of naming winter storms. I certainly won’t let it spoil my fondness for Nemo, both the movie and book characters. How do you feel about this idea of naming winter storms? This entry was posted on Tuesday, February 12th, 2013 at 10:50 pm and is filed under News Roundup. You can follow any responses to this entry through the RSS 2.0 feed. Both comments and pings are currently closed. What an amazing photo of the scar left behind by the June 1 tornado. Great catch, Dr. Shepherd! Plan on using it (with proper credit, of course!) in my educational show on the June 1 tornado, as well as another show I’m developing for my office on the Blizzard of 2013. LOVE this website!